Cikgu Naza: [Science Form 4] Molecular Or Ionic? [Science Form 4] Molecular Or Ionic? When one or more electrons are transferred from one atom to another, the atom that gains the electron or electrons becomes negatively charged whereas the atom that loses the electron or electrons becomes positively charged. These atoms with their positive or negative charges are called ions. The number of protons and electrons differ in an ion. There are more protons than electrons in a positively-charged ion. In contrast, there are more electrons than protons in a negatively-charged ion. Some atoms like sodium atoms, potassium atoms and fluorine atoms are very reactive as they can easily turn into ions by losing or gaining electrons. Meanwhile, two or more elements can bond together to form compounds. The bond can either be molecular or ionic. When atoms share electrons in covalent bonds, molecular or covalent compounds are formed. 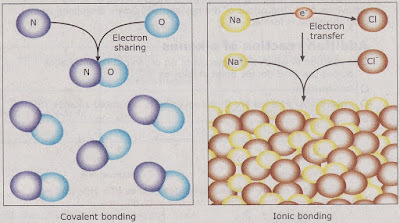 In contrast, ionic compounds are made up of positive and negative ions in ionic bonds.